The value of a painting is influenced above all by the artist who created it and his reputation. Painters nowadays are easy to identify and are used to signing their artworks. But what about those whose names have not survived the test of time? To overcome the crucial problem of anonymity in art, some art historians have, since the end of the 19th century, followed the practice of creating provisional names (“Master of”) if they are able to single out a particular artistic personality in several paintings but cannot provide a name or biographical information because of a lack of surviving documentary records (contracts, inventories, biographies, correspondences, etc.). Masters with Provisional Names (MPNs hereafter) are often overlooked in quantitative studies. By contrast, our research is dedicated to them. To analyze the effects of provisional names on price formation, we compare the market behavior of 15th and 16th-century Flemish MPNs auctioned between 1955 and 2015 with the price evolution of anonymous and named Flemish artists for the same period. Figure 1 provides an index, based on a standard hedonic regression for each of the subgroups. Intuitively, one could have expected MPNs to fetch higher prices than anonymous artists for whom no tangible information is provided, but lower prices than for named masters whose identity is known. Indeed, in the latter case, the association of a painting with a name is likely to increase the buyer’s confidence. Our figures confirm the first assumption, but strikingly refute the second one; MPNs outperform both named and anonymous artists. This may however be explained by the fact that art historians create MPNs only for paintings meeting a certain quality or, at least, singular characteristics. By contrast, being able to identify a given artist by his name is not strictly linked to the quality of his work, as less talented artists may be identified because they signed their works. Artist brands and the concept of storytelling may be another way to account for this result. Strong brand narratives, and easy-to-recognize brands are prerequisites if artists want to become successful on the art market (Preece and Kerrigan, 2015). Some artists, such as Andy Warhol, have followed deliberate strategies to develop their brand name, and may even be viewed as brand managers (Kerrigan et al. 2011). Provisional names convey by construction some information about the paintings or the artist. As a result this might serve for the ex-post story-telling created by the experts or art-historians allowing potential buyers to remember a characteristic of the artist which is embedded in his name. It is however likely that provisional names need time to get established and act as a brand. The value of the brand may also be influenced by its creator and the message conveyed by the name may also be appreciated differently by market participants. To test these ideas we include in our regression a dummy variable if the provisional was created by Max Friedländer, arguably the most famous expert working on our period of interest, the presence of the provisional name in well-established art dictionaries (Thieme & Becker and Grove as way to test the brand legitimacy), the number of years elapsed since the creation of the provisional name (a way to proxy for long term recognition), the number of previous sales between the creation of the name and the sale of interest (to proxy for visibility) and the typology of the name (five main forms are considered: names based on a location, a date, a key composition, recurring formal characteristics, or the name of a previous collector). Table 1 provides the results of our estimates. Note: All models are estimated using OLS with White heteroscedasticity-consistent standard errors and covariance. The dependent variable is the natural log of the real price. In all regressions coefficients are significant at the following levels of confidence: *Significant at 10%; **significant at 5%; ***significant at 1%. The coefficient picked up by the Creator variable shows the economic weight of being created by Friedländer, compared with a group of artists named by other scholars. The value of the certifier is high because Friedländer is associated with highly regarded scholarship. 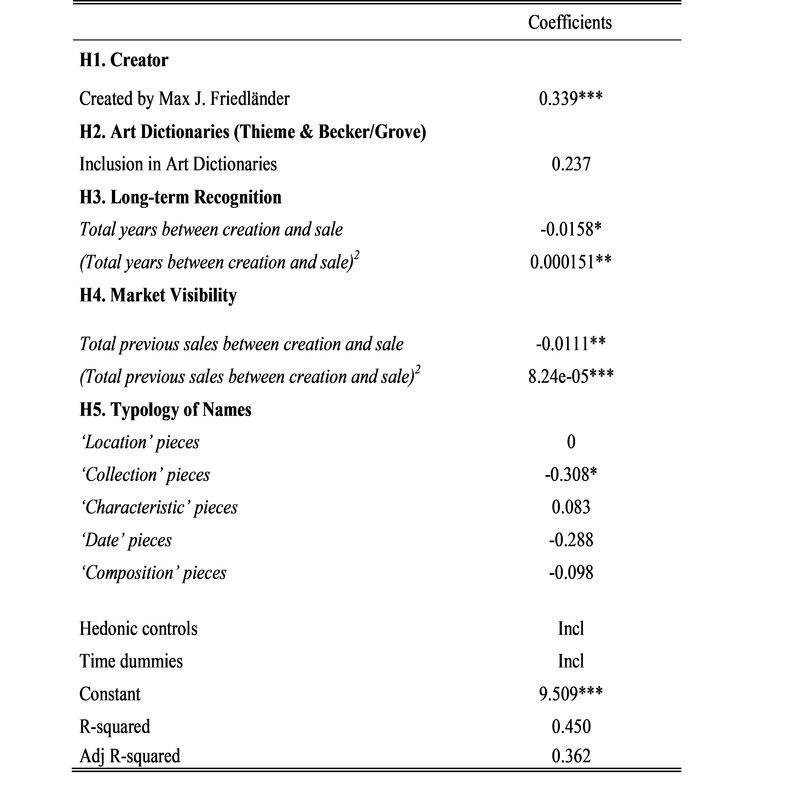 The Art Dictionaries variable, which tests whether the inclusion of a name in art dictionaries is an attractive signal for the market, does not come out significantly different from 0. The third variable tests the long-term recognition of the artist. We find that earlier names are better acknowledged and fetch higher prices than new ones. The last hypothesis deals with the typology of names traditionally used by art historians. The visual and semantic aspects of a brand are crucial for its success. The ‘Location’ pieces variable is taken as reference group, and compared to this category of names; the only coefficient that becomes significantly negative is that of names referring to a previous collector or collection. This category of names provides no specific information about the artist or his work. Short of having a clear idea of the original composition in mind, names such as the Master of the Bentinck-Thyssen Madonna or the Master of the Von Groote Adoration prevent consumers from having an immediate representation of the key characteristic of the artist. By contrast denominations based on location may evoke a more precise image of the artist environment. Even nowadays, artist may decide to include in their brand story their country of origin. This would for example be the case of the “YBA” label. One could argue that since our sample focuses on Flemish Masters only location is already known. This may explain why the location effect is not stronger once compared to other categories. Eventually, complex spellings or foreign names can make it hard to memorize the name of an MPN, which could be detrimental to its market. Kerrigan, F., Brownlie, D., Hewer P., Daza-LeTouze, C. (2011). Spinning” Warhol: Celebrity brand theoretics and the logic of the celebrity brand. Journal of Marketing Management, 27(13/14),1504-1524. Preece, C., Kerrigan, F. (2015). Multi-stakeholder brand narratives: An analysis of the construction of artistic brands. Journal of Marketing Management, 31(11/12), 1207-1230. Oosterlinck K., Radermecker A.-S., (2018), “”The Master of …”: Creating Names for Art History and the Art Market“, Journal of Cultural Economics, forthcoming.